Ongoing growth through professional development enhances a Respiratory Therapist’s (RTs) ability to provide safe, competent and ethical patient/client care. The CRTO’s Professional Development Program (PDP), which is mandated by the Regulated Health Professions Act and overseen by the CRTO’s Quality Assurance (QA) Committee, is designed to support the ongoing continuous quality improvement of all its Members. Professional development encompasses many forms of learning opportunities, ranging from formal education, such as degrees, conferences, employer-based educational programs and certifications, to the less structured, day-to-day forms of learning, such as rounds, webinars and consultations with a colleague. The Launch RT Jurisprudence Assessment is an online, web-based, open-book assessment consisting of 60 multiple-choice questions. All new or recently reinstated CRTO Members are required to complete Launch RT. This will ensure all RTs in Ontario have the appropriate degree of knowledge regarding standards, guidelines, legislation and regulations that govern their practice. The RelevanT Learning Module is designed to ensure all RTs remain current in their knowledge of the standards, guidelines and legislation that govern their practice. This online module takes approximately 20 minutes to complete and consists of practice standard changes that have occurred over the past year (e.g., recent regulation changes, new or revised professional practice guidelines, etc.). The online elearning module will provide Members with all the pertinent content and then present a short series of questions (approximately 5) related to the information contained within the module. The goal of the RelevanT Learning Module is to maximizing learning, and so the questions can be attempted as many times as necessary until the correct response is obtained. The PORTfolio is a professional development tool used to capture ongoing professional learning by all CRTO Members on an on-going basis. Members acknowledge annually that they are participating in the CRTO’s Professional Development Program by engaging in ongoing professional development activities and regularly recording these activities in their PORTfolio. All General, Limited and Graduate Members are assigned a Review Year after the completion of Launch RT (if required). This Review Year will dictate when each Member’s PORTfolio is due to be submitted. Once the Member’s PORTfolio has been submitted and assessed, the Member will be assigned their next Review Year. You can access the new PORTfolio in the Member Login section of the CRTO website under Professional Development. Once you login, you will see the PORTfolio has been redesigned and consists of three sections (Self-Assessment, Learning Log & Learning Goal). If you want to view your past PORTfolios, simply go to the Archives tab on the right-hand side. Please note that this link to the old PORTfolio platform will only be available until December 2018, so be sure to download (to print or PDF) any information you want to keep for your own records. Step 1 – Complete your Self-Assessment. This will result in the creation of potential Learning Goal(s) for you to pursue. Step 2 – Review the Learning Goal(s) created by your Self-Assessment and select one (1) goal to be reviewed by an RT Peer Assessor. If you don’t wish to use any of the Learning Goals transferred from your Self-Assessment, you can create one of your own. Step 3 – Engage in ongoing professional development activities and keep your Learning Log up to date on an ongoing basis. All the information necessary to complete and submit your PORTfolio is included on the platform. You can also find additional information by following this link. If you have any other questions about PORTfolio, or any other component of the CRTO’s Professional Development Program, please contact Carole Hamp, RRT – Manager of Quality Practice at hamp@crto.on.ca or 416-591-7800 x 33 / 1-800-261-0528 x 33. A SCERP may be required if it is identified in the Launch RT Jurisprudence Assessment or the PORTfolio assessment process that a Member requires additional education and guidance in order to successfully meet their CRTO PDP requirements. 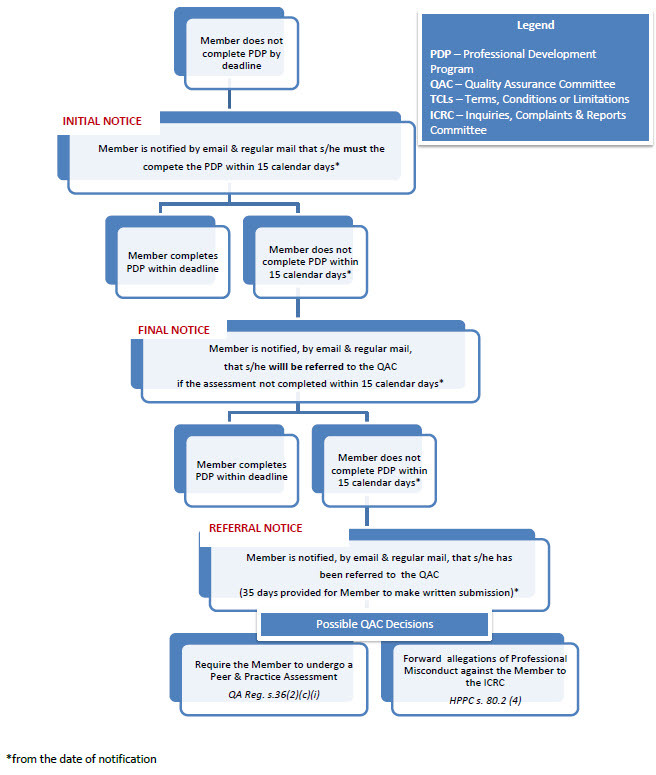 Once a SCERP is completed, the CRTO QAC may determine that further assessment is necessary and the committee has several assessment options available. One of those is for the Member to undergo a Practice Assessment. This assessment would be conducted at the Members practice site (or other appropriate location) and facilitated by an RT who has been trained as an assessor. 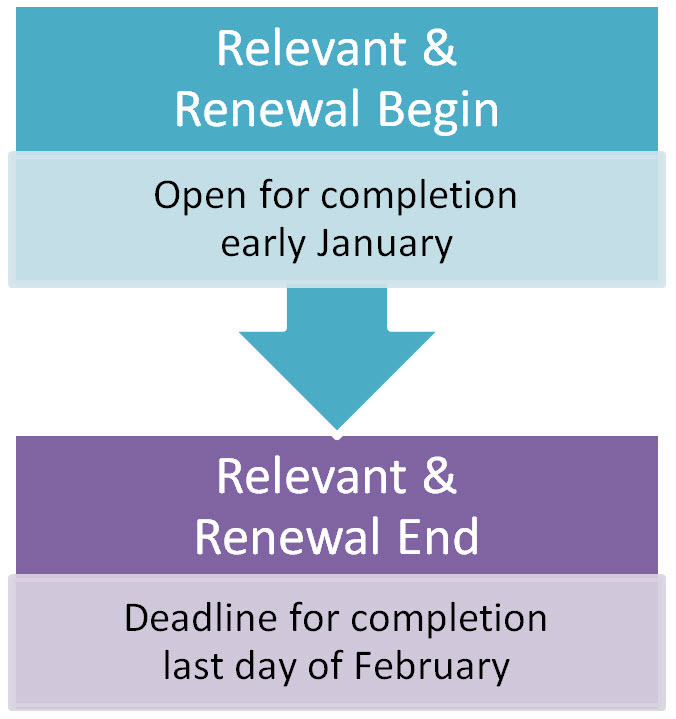 Relevant e learning module dates coincide with registration renewal each year. Each Member has or will be assigned a Review Year. 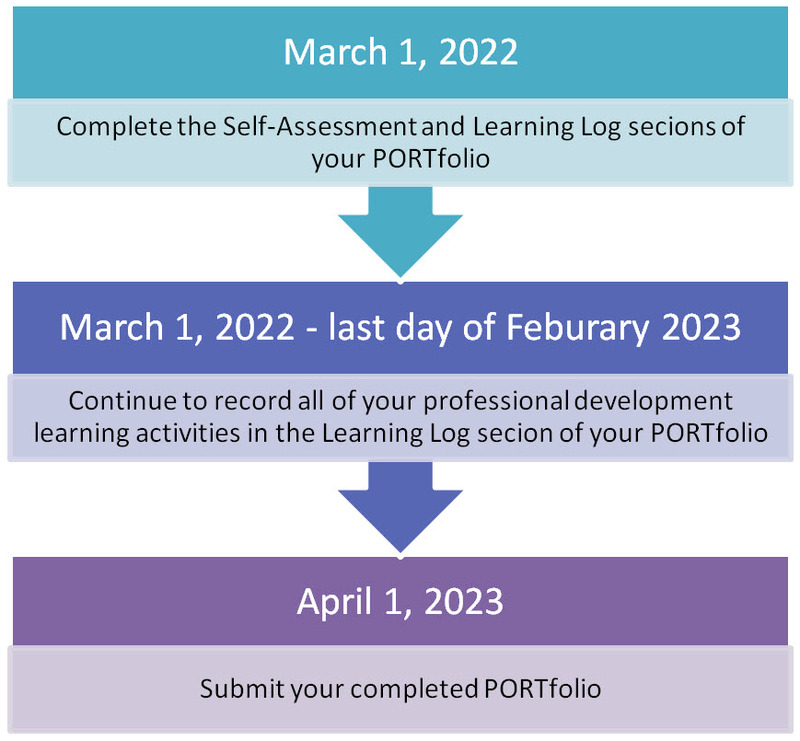 Example: If your Review Year is 2023, then you would begin your PORTfolio by completing the Self-Assessment and Learning Goal sections in March, 2022 and then include all your professional development in the Learning Log section from that point up to the end of February 2023. You will then submit the completed PORTfolio by April 1 2023. For more information on the CRTO Professional Development Program, please follow this link to the PDP Member’s Guide.